The Courtesy Lights will automatically lit up whenever the room is dark, when the standard lamps are off during nighttime, or in windowless rooms. The lamps come in two versions (positioned at the top or bottom of the wall) and four custom light colours (blue, white, amber and red). - Radiance users, while appreciating the overall lighting effect, often have problems clicking objects in unlit rooms, because they are too dark; the dim light cast by the Courtesy Lights will help seeing the objects in the room, while not ruining the realistic effect granted by the Radiance. - Smarter Lights users will appreciate the nice effect provided by the Courtesy Lights, that automatically turn on and off, room-by-room, as soon as the main light goes off. - All the users, with the Courtesy Lights set at low-level intensity, can add a suggestive touch to a special room or outdoor environment; when used at high-level intensity, these lamps (especially the white one) will act as Emergency Lamps. If still someone uses some old mods that enable the hidden "Power Outage Scenario", they can play the scenario with the Emergency Lights turned on. I don't like clogging the users' catalog with a lot of icons, so I reduced the icons to two only (blue lamp, high and low version). 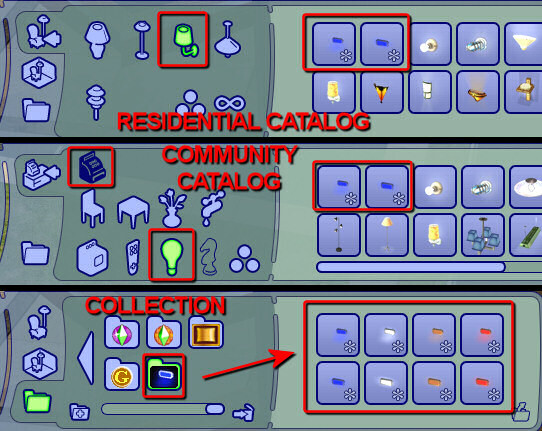 You can select all the various colour directly in game, clicking on the lamp, or using the special collection, embedded in the object: just look under Collections, either in the Residential or Community catalog, and you will see all the 8 icons (2 versions x 4 colours each). IMPORTANT: the alternative meshes and light colours are strictly interconnected, within the package; therefore, deleting one colour, or one mesh, or the 'collection', will cause the entire set to be deleted. Turn ON and Turn OFF: you can set to "Manual ON" or "Manual OFF" a single light, all the lights in the room or all the light in the lot. IMPORTANT: the action will affect only the Courtesy Lights: the standard lamps are not affected by any of the options available for the Courtesy Lights! Turn AUTO: this option activates the automatic switch for the Coutesy Lamps (again, the action does NOT affect the standard lamps). When in auto mode, the Courtesy lamps will automatically turn on when the room is dark. The internal routine works fine with or without the Smarter Lights installed. Outdoor courtesy lights, during nighttime, turn on whenever there are no lit lamps within a radius of 10 tiles around them. Intensity...: you can manually increase or decrease the intensity of a single light, or the general intensity of an entire room. The "Auto" option automatically adjusts the intensity of the light proportionally to the room area (Auto-intensity is not available for outdoors lights). Bulb Colour...: you can change the colour of the lamp; the light cast by the lamp will change accordingly. setting the light intensity: after placing the light in the lot, pick it up again: the intensity will be decreased by 10%, and a message will tell you the new intensity level. Repeating the Pick & Place procedure many times, you can choose exactly the intensity you want for a specific room. The Courtesy Lights are fully compatible with any game configuration, from the base game to Apartment Life. Moreover, they are fully compatible (they are actually tweaked to work in conjunction with) the Radiance mod and the Smarter Lights. These lamps are not global mods, and therefore can't conflict with any global mods related to light and lamps. - four ".nlo" files containing the custom light definitions; these files require the Scriptorium in order to be installed; after installing the Scriptorium, double-click on the shortcut "Scriptorium_CustomLights" that you will find in yout Downloads folder: it will open up a window, where you have to put the four ".nlo" files extracted from the RAR. IMPORTANT - Using the Scriptorium and installing the custom light definitions is not strictly required. 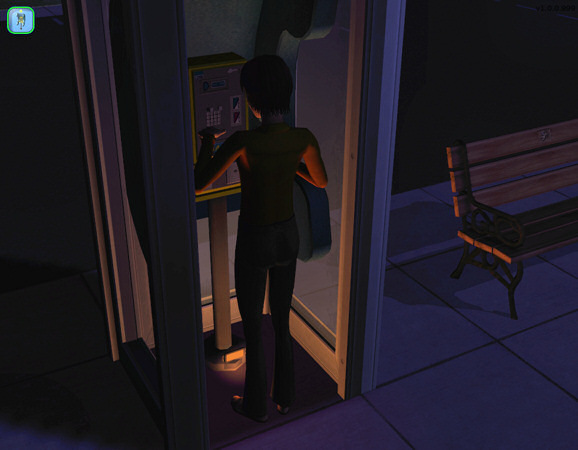 The lamps already contain the light definitions, but there is a known bug in the game that causes the light not to be reflected by walls and floors, when you exit and re-enter the lot. In order to prevent this bug, you are strongly advised to install the custom light definitions via the Scriptorium. Before you ask, NO, the light can't be recoloured. Only the frame surrounding the bulb is recolourable: the lamps come with two colour options for the frame: metallic gray and wood. DON'T CLONE - DON'T REPOST ANYWHERE. You can include the lamps in your lots, as long as you upload them to 100% free sites (NO EXCHANGE), give credits to me and provide a link to this very thread. You can recolour the frame, and upload the recolours to any site, as long as you DON'T include the mesh, and provide a link to this very thread. 416 faces, 563 vertices for each lamp.